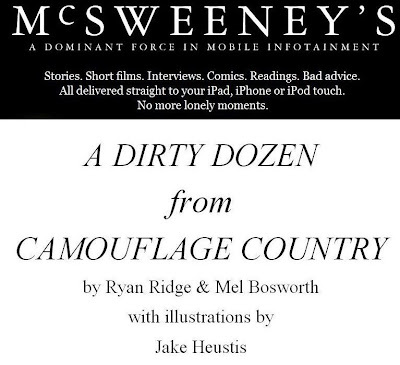 An excerpt from CAMOUFLAGE COUNTRY, the once esoteric but no longer esoteric project I’m co-writing with the amazing author Ryan Ridge with illustrations by the outstanding artist Jacob Heustis, is very much forthcoming in the astounding McSweeney's Small Chair. What does that mean? It means that folks with an iPad, iPhone, and iPod touch can get their eyes on some super exclusive material if they download the app from the App Store. The first month is free & subscriptions can be renewed every six months for $2.99. Not an Apple person? Well, you’ll just have to wait and see where another DIRTY DOZEN from CAMOUFLAGE COUNTRY pops up next.